However, the top part of the chart was cut off. If you click on the link to the Excel file on Google drive (you’ll have to do maximum zoom to be able to read it) you can see the top, but I think the size is about the same as clicking on the image above. So my apologies I could not do better! I promise it looked nice in Excel! The first question on top is supposed to be “How do you feel about science fiction?” and your two options are: “I enjoy Star Wars and other science fiction” and “I am uncertain about science fiction.” Now, I am going ahead and say that even though I think more of you would like Star Trek than you realize, I also fully recognize it is NOT for everyone. If you watch a few of these episodes and still find yourself saying “meh,” you probably won’t like the show overall. Some (but not all) of the episodes included on the chart are universally claimed by fans to be some of the best, so if you don’t like something we consider to be the best in the series, you’re probably not going to like the rest of it either. Star Trek does include a lot of “technobabble” (difficult and probably made up talk about science fiction-y things), space battles, and aliens, but it also includes a close look at humanity, philosophy, and characters. However, if you trust my judgment on anything and the idea of a space-based show doesn’t totally weird you out, I think you should at least try out a few episodes (all episodes available for streaming on Netflix or at startrek.com) and see what you think. I can understand these concerns, as they were probably mine as well when I first started watching. The original series was filmed in the 60s, and it has it share of cheese at times, but some of the episodes are also really good and full of meaning. Yes, it was obviously filmed in the 60s, but if you can get past that and enjoy the story, I think you’ll be glad you did. The series was actually culturally groundbreaking in many ways. The Next Generation might be the most beloved of the series, and it (especially the early seasons) is so clearly from the 80s. Again, once you get past the look, you can really enjoy what the episodes have to offer. If you’re familiar with Wil Wheaton/Wesley Crusher, here he is looking 80s-tastic in one episode. He was more commonly seen in uniform or in ugly 80s sweaters. I think once you get to Deep Space Nine, Voyager, and definitely Enterprise, you see a lot less of the hokey-looking stuff. And of course, I think the new J.J. movies look slick and can be a nice introduction to Trek if you’re thinking about whether or not you want to delve into the deeper waters of the TV shows. 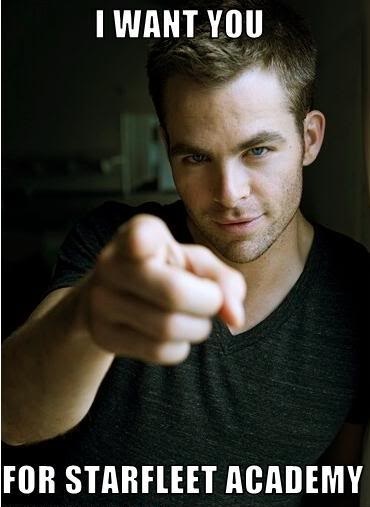 Don’t let Chris Pine down now! If I was told you could only watch two episodes of Star Trek to give you the scope of what it stands for, I would go with the fun and quirky Star Trek original series episode “The Trouble With Tribbles” and the Deep Space Nine episode “In the Pale Moonlight.” The latter is my absolute favorite of all Trek and I almost would hate to give it away out of the gate, but at the same time I would hate for anyone to judge the series without having seen it. The funny thing about me liking this episode so much is that the creator of Star Trek, Gene Roddenberry, was probably rolling in his grave when it aired. You see, Gene Roddenberry had a vision of the future that was a utopia, at least for Earth and its allies within the Federation. They were clearly the good guys, they did all the right things, period. But we know things aren’t that clear cut in real life. The reason why I love Deep Space Nine so much is because it shows the dirty underbelly of what happens when good people find themselves in desperate circumstances. The series contains amazing character story arcs, and this sixth season episode is a big turning point for Captain Benjamin Sisko. 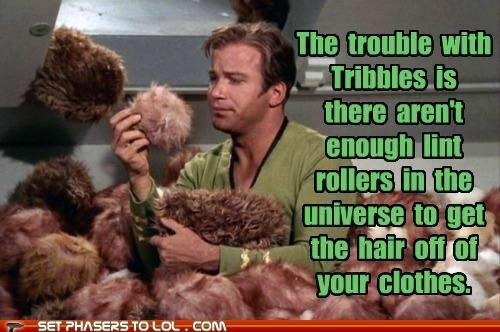 “The Trouble With Tribbles” is the exact opposite of “In The Pale Moonlight.” It’s light and fun but also a favorite among Star Trek fans. Deep Space Nine paid a wonderful homage to the episode with their episode “Trials and Tribble-ations,” but you should see the original first. What can you not love about an endless number of furry, cooing space animals? So if you’re interested in trying Trek out, open the chart and follow the statements that most apply to you. Watch the episodes. When you’re finished with them, if you enjoyed them, try out another statement and those episodes, and try that for as long as you want. Then if you’re ready for more, you can try the new movies, or start from the beginning of the series that seems the most interesting to you, and go from there. If you want, you can go with the order the shows were created, which would obviously mean begin with The Original Series (TOS). As mentioned before, you have to remember that this show was created in the 1960s and can be hokey at times, but there are plenty of episodes that show depth. It’s also only three seasons, a light commitment compared to all of the other series (not including The Animated Series… but we’re not talking about it today). It also has a few movies. You could also start with the chronological beginning, which would be Enterprise (ENT). The first season is not the best and the finale of the show is the worst episode of Star Trek ever, but it does pick up after a time and has a really interesting and intense story arc that pretty much takes up the third season of the show. It has four seasons overall. If you are looking for quintessential Star Trek, that can be light-hearted or deep, but was better produced than the original series, check out Voyager (VOY). 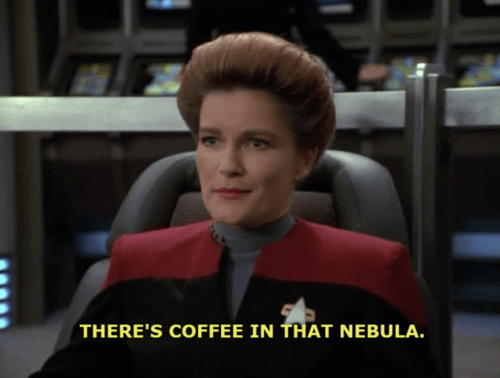 Its pilot might be the best in all of Star Trek. It has seven seasons and is the favorite of Kelley’s from Another Novel Read. If you like philosophy and psychology, you might enjoy starting with The Next Generation (TNG), but you will have to patient and forgive the first season or two. After that though, it’s quite enjoyable! It has seven seasons and a few movies. And then if you love continuing story and character arcs and stories that really make you think, Deep Space Nine (DS9) might be a good place for you to start. It is the best developed series of Trek, in my opinion, and really starts kicking late in the second season. Its finale is probably my favorite of all the series. 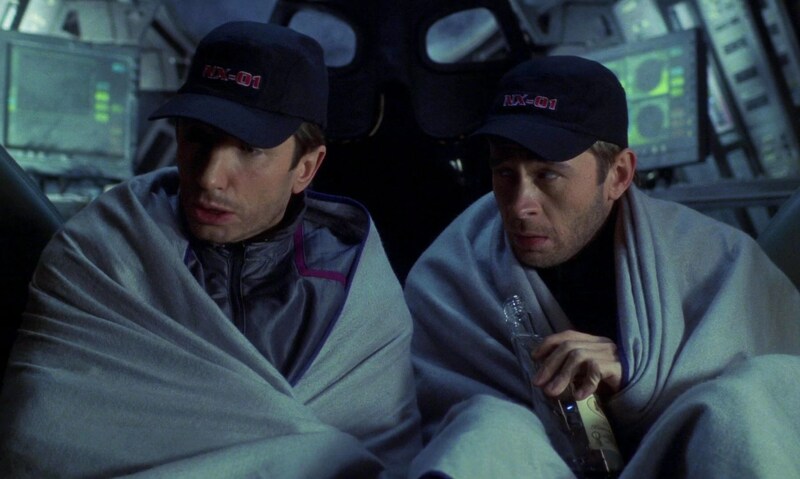 It’s also known for being the “darkest” of the Treks, but I think it also has some of the most fun episodes as well. It also has seven seasons. 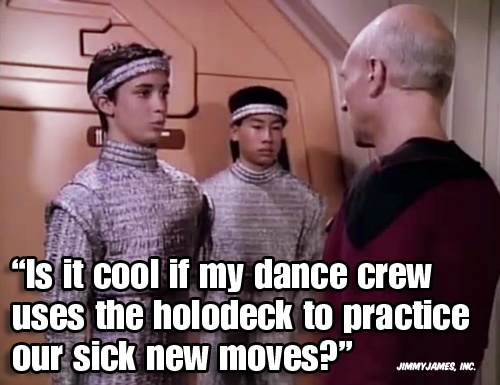 And Tweet me anytime (@acps927) if you have a question about Trek! I will recommend episodes, movies, podcasts, or answer general questions you may have (unless they deal with spoilers… then I’ll make you find out on your own!). Being a Star Trek fan is a lot of fun. It’s a culture of its own. We love the best episodes and love to hate the worst. It will undoubtedly take some time to understand the difference between a Vulcan and a Romulan or to get used to certain things, but in the end, I think it’s worth it and quite a fun ride. Are you going to give Trek a try? Let me know if I’ve piqued your interest or if you have more questions! 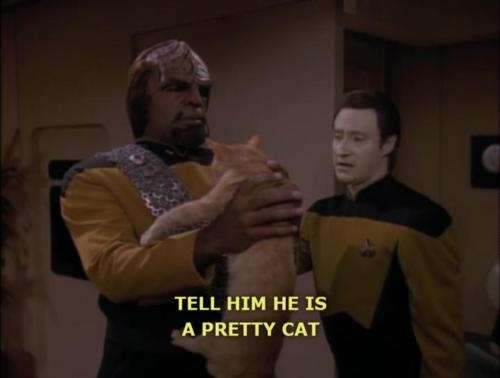 This entry was posted in Geekery, TV and tagged geek, star trek, TV. Bookmark the permalink. You’ve definitely piqued my interest! I think the chart is really handy because really, when looking at Star Trek, there is just so many different ones to choose from and it can be really overwhelming to decide where to start! Of course, I don’t have Netflix so can’t watch the shows through there, but I’ll see what I can do. I wouldn’t mind watching the three episodes that showed up on the chart based off my choices at least! Doesn’t hurt to try! You can check them out at startrek.com/videos. I’d love to hear your thoughts when you see them! It’s clear that you love this series and think that anyone can enjoy it too — as is the same for me! Your flowchart is AWESOME, and I really hope that some people will try it out and like what they see! Ha ha, there’s nothing wrong with Star Trek love! And I called myself a fan long before finishing all the shows, so I get it, it takes time! And I hope my flowchart helps someone out too! Good post. Awesome flowchart. You definitely picked out some good episodes for that part. Thanks! Glad you approve of them! A few of them weren’t as fresh on my brain as the others and was hoping I was doing alright to pick them! Wow Amy those flow charts are great! I love that you took the time to break the different eras of Star Trek down in a way that could appeal to anyone. I did watch the first Star Trek movie (of the more recent ones) and thought it was beautiful. I didn’t care for the characters and their interactions all that much but it was certainly fun to watch, from a space and battle and futuristic standpoint. “The reason why I love Deep Space Nine so much is because it shows the dirty underbelly of what happens when good people find themselves in desperate circumstances.” This. This is what is going to make me go watch Star Trek. So glad you liked my flow chart! Ah Shatner and his cheesetastic acting, ha ha. The original series can be silly at times, but like I said, they do have some good, deep episodes. 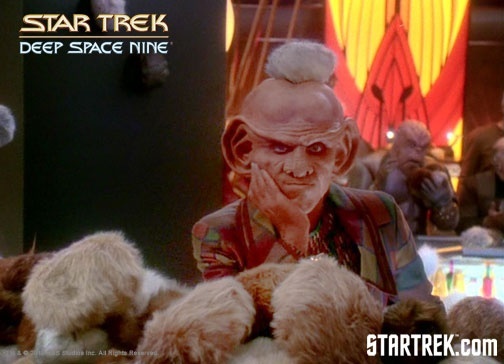 And from that quote of mine you pulled, sounds like you would be a fan of Deep Space Nine! If you check any of the episodes out from the flow chart let me know what you think! Yay, I’m so glad! Let me know your thoughts when you watch a few episodes! WOW way to go on that flowchart!! I am truly amazed!! (My inner Excel enthusiast just really, really wants to hug you right now haha) I am not a full-fledged Trekkie, I have to admit that it took quite a few episodes and then A LOT of Chris Pine to get me into the series. My husband and mother-in-law are big fans too so that kinda helped usher me along the path. I think this is such an awesome post for anyone wondering about the fandom, you did such a good job!! 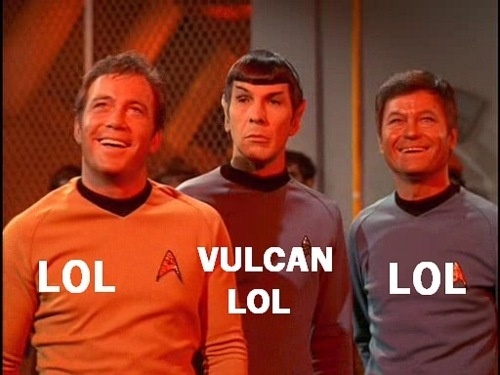 And the Vulcan LOL made me laugh so hard!! Thanks for the kind words about my flowchart! My husband is an accountant so he is big on Excel, and I think he’s proud too anytime I actually choose to use it, ha ha. He’s also the one who got me into Star Trek; we started at the beginning and watched all the way through! I can understand for some people that it can be hard to start off that way. Are you going through a particular series right now, or just watching whatever comes your way? Ahhhhh this post is all kinds of AWESOME!!! I adore it and now I want to go back and watch each of the suggested episodes!!! Thanks! So are you a Star Trek fan already or not? Great post! I have always loved Star Trek (only series I had trouble getting into was Enterprise). I was originally a huge Next Generation fan but Deep Space Nine overtook it as my favourite though I will always credit NG as the series that hooked me in! I think I like Deep space Nine the most because it wasn’t always standalone episodes – the story arcs drew me in more. Plus Cardassians!! Same here! And I think for that reason you’ll like the third season of Enterprise. The fourth season is good too. Minus the last episode. UGH. I have heard a lot of bad things about the last episode lol.